It's time to get your goof on, ladies and gentlemen. Four legends - I do not use the term lightly - LEGENDS of the Silver Screen join forces to asphyxiate you with laughter. Your mirth will be so great that you will struggle to find the breath to say "Stop, you're killing me!" The little studio put together by James H. Nicholson and Samuel Z. Arkoff (I always read that as Zarkoff. It tickles my funny bone. ), American International Pictures found its niche by catering to the young audience ignored by the big shots of the movie industry. The drive-in crowd enjoyed the juvenille deliquency plots of Reform School Girl and Hot Rod Girl, and the contemporary music of Shake, Rattle and Rock!. Horror added another area of success with I Was a Teenage Werewolf and his kin Frankenstein and Cave Man. Success was found by upping the production values on a series of features produced by Roger Corman. Stories loosely adapted from Poe had name recognition value, as did leading man Vincent Price. Audiences flocked to House of Usher, The Masque of the Red Death, The Tomb of Ligeia and Pit and the Pendulum. Ooh, it may be springtime, but I just got a Hallowe'en chill up my spine. 1963s The Raven directed by Corman from a Richard Matheson screenplay has little to do with Poe, but everything to do with sending up the genre in fine style. 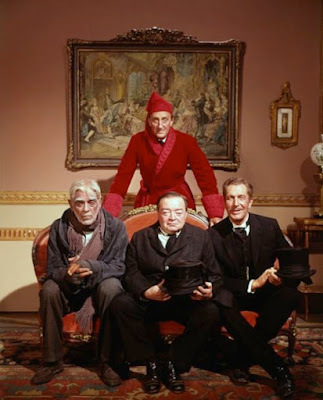 Vincent Price and Boris Karloff are rival wizards and Peter Lorre turns into a crow. 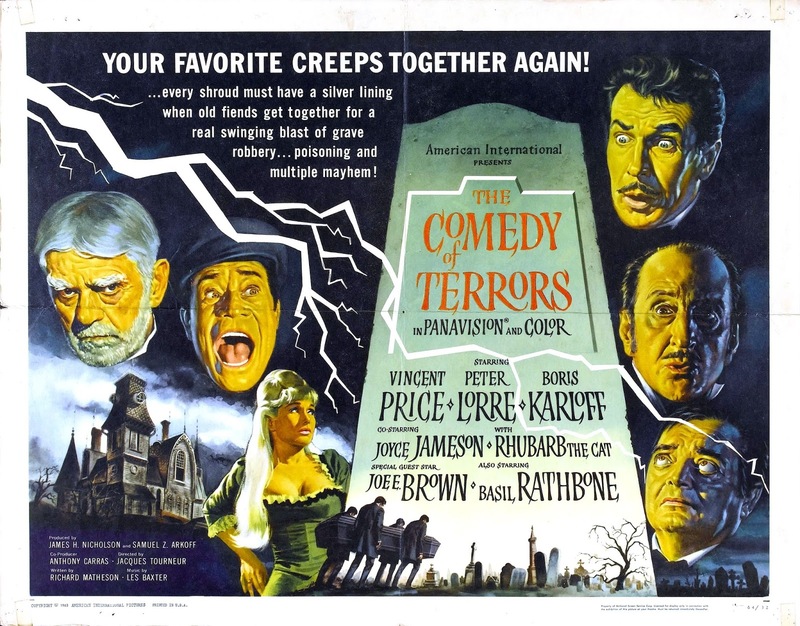 It is a hoot and was quickly followed by The Comedy of Terrors, my TCM choice for this month. Sadly, in terms of finances my movie wasn't boffo box office so further comedy-horror ventures fermenting in Matheson's mind for the studio and these stars were scrapped. Ah, what could have been! Regarding The Comedy of Terrors, who better than multi Hugo and Edgar nominee Richard (I Am Legend) Matheson to spoof the genre he knew inside out? The director is Jacques Tourneur who gave us Cat People, I Walked With a Zombie and Night of the Demon, also the quintessential noir Out of the Past and the charming piece of Americana Stars in My Crown. The house cinematographer was Oscar winner for High Noon, Floyd Crosby and Les Baxter handled the musical chores. With these guys behind the scenes and the legendary cast on the screen, The Comedy of Terrors is a treat on all levels. Waldo Trumbell (Vincent Price) has married into a prosperous undertaking business and run it into the ground. He spends his days trying to murder his father-in-law Amos Hinchley (Karloff) and arguing endlessly with his wife Amaryllis (Joyce Jameson), a frustrated opera singer. The household is rounded out by a cat, Orangey, and Waldo's put-upon assistant Felix Gillie (Lorre). Gillie has an unspoken and deep affection for Mrs. Trumble adding a touch of poetry to our story. Jameson nails the role of the neglected wife. Boris Karloff as her whiny old dad doesn't appreciate how she saves him from certain death at the hands of his son-in-law every day. Boris is a mess, and a quiet riot as Hinchley. The firm has but one good coffin which they retrieve after mourners have left the graveyard to recycle for the next customer. Finances are so bleak that Trumbell and Gillie have to go out into the cold night to round up customers - the willing and the unwilling. Even this effort does little to alleviate the pecuniary situation so when the landlord Mr. John F. Black (Rathbone) gives notice of eminent eviction Trumble plans to kill two birds with one stone, so to speak, by making Black their next client/victim. Far from solving all of his problems, Trumble has only created more. The penny-pinching, Shakespeare quoting landlord simply will not die! He passes out. His heart stops beating, however, he will not get in the coffin and stay put! Oh, the indignity! It is here that Basil Rathbone picks up the movie, puts it in his back pocket and walks away. He is incredibly funny while stealing the movie, which you must admit is quite a feat with this cast of supreme hams giving it their all. 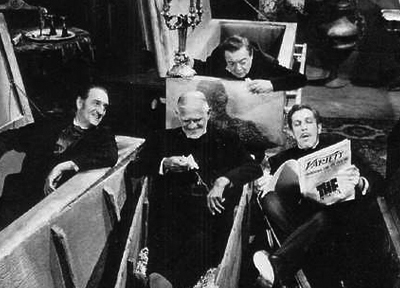 In an interview included with the DVD release, Richard Matheson said Rathbone took to the part on the first read-through. Supplemental viewing: 1939's Tower of London starring Basil, Boris and Vinnie. The Comedy of Terrors cracks me up, and if you are the sort of goofs I believe you to be, then you will not want to miss it. 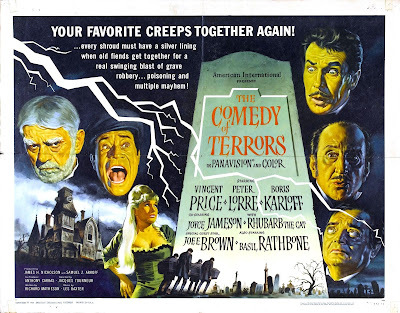 TCM is spotlighting American International Pictures this month on Thursdays and that is where you will find The Comedy of Terrors on May 12th at 2:30 in the morning. I hope your post and TCM's broadcast help this very funny film attract more of a following. It certainly deserves it. I saw it on 16mm in a film club in the mid-1970s and laughed out loud through most of it. As you noted, Matheson knows the genre and how to spoof it. And what a cast! It's better than THE RAVEN. I agree. I enjoy it more than "The Raven", and I do get a kick out of "The Raven". "The Comedy of Terrors" is so audacious and hilarious it really shouldn't be missed. Let's start a cult. I guess we'll need T-shirts and a secret code to start. "What place is this?" should suffice.